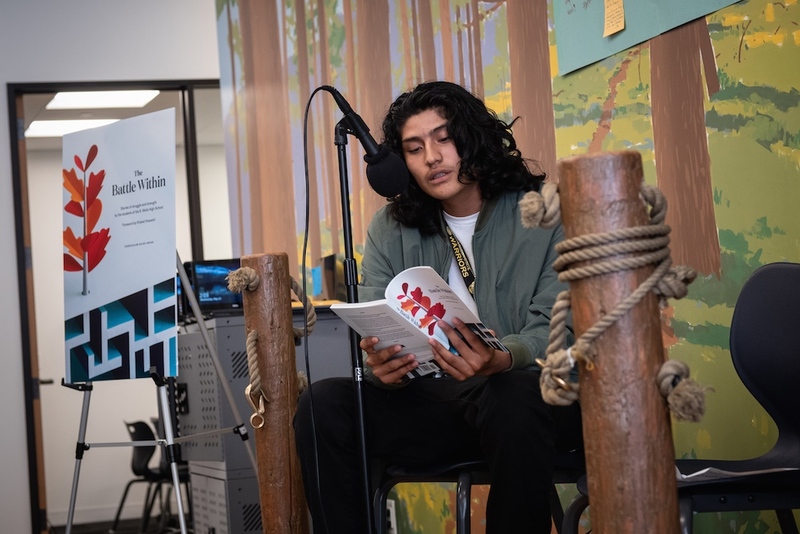 “We’re gathered here today to celebrate the release of The Battle Within: Stories of Struggle and Strength written by students at Ida B. Wells,” In-Schools’ Program Manager Ryan Young broke the silence as students clutched their newly published book. The class’ co-teachers, Ms. Taylor and Mr. Hennessy, along with other students and their families, volunteer tutors, 826 staff, and Khaled Hosseini (the esteemed author of The Kite Runner) gathered at the 826 Valencia’s Tenderloin Center for the book-release party. Cheers and applause erupted as Ryan finished his sentence, setting the festive tone for the rest of the evening. Smiles were permanently plastered on faces as students read excerpts from the book, answered questions about their writing process, and enjoyed popcorn, cookies, and lemonade. Another notable aspect of this year’s YABP was the partnership with Khaled Hosseini as his book The Kite Runner was the thematic inspiration for The Battle Within: Stories of Struggle and Strength. Students’ analysis of the characters in The Kite Runner became seeds for their writing. In the span of ten tutoring sessions, students were able to write, revise, edit, revise, edit again, and finally publish their work with the assistance of one-on-one tutor support. When asked about how the students felt about the tutors, one student commented, “They were really nice…someone was there that enjoyed writing as much as I did, and they offered a ton of different ways to improve my writing.” In addition to having tutor support, students also welcomed Hosseini to their class to read a chapter of The Kite Runner and answer their questions about his inspirations and decisions in writing. Hosseini also wrote the foreword for The Battle Within: Stories of Struggle and Strength and graciously signed students’ copies at the book-release party. Another reason for celebration was the surprise announcement of 826’s Teacher of the Month award to Ms. Taylor and Mr. Hennessy. They were unable to hold back the tears as their students cheered and clapped in approval. Mr. Hennessy said, “I love what I do, and the students always surprise me. I’m doing this for you, guys, thank you.” This is our way of acknowledging the tremendous work and support from both Ms. Taylor and Mr. Hennessy.